Added autoexec.cfg to local admin menu mod to make sure it always works. A few misc and random bug fies. 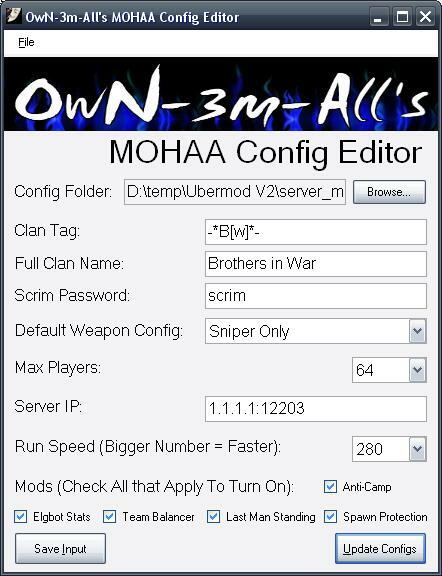 Improved MOHAAConfigGenerator.exe to setup and automatically configure initial base mods (elgbot, lastManStanding, teamBalance, antiCamp, SpawnProtection) based on GUI selection. Hey All! I'd like everyone to please test this mod! All of the information you need is written below! Please report any bugs, something's not working, suggestions, and comments here. I've tested it, but I may have missed some things! Please let me know what you think! Download The Ubermod -- scroll down the description and click on the download button. It’s a collection of mods, configs, and scripts all-in-one! It is the only mod you need on your server. Anti-crash fixes and anti-shark fixes have been implemented in this mod. This mod uses creaper’s weapons mod. Make a backup / copy of your current mods on the server. You'll need to remove all mods, as some mods may conflict with the ubermod. The ubermod has everything you could ever possibly want. This mod requires the server to be running the latest version of Reborn. This is the unofficial 1.12 patch that adds new functionality that is critical to the operation of this mod. To download and for more information, visit X-Null. 1. Extract the zip to a folder on your PC using a program like WinRar. 2. From this folder, browse in the server_mod directory by double clicking it. 3. If your server runs a Linux server, double click on the linux folder. 4. If your server runs a Windows server, double click on the windows folder. 5. Within this directory, double click on the main folder. 6. Double click the configs directory. The config folder should be set to the current directory of all the configs. However, if you wantto use the config generator for other configs, click the “Browse...” button and pick a folder where you have config files. It is recommended not to change this! • In the “Scrim Password” field, set your clan’s desired scrim password. • In the Max Players dropdown, choose the number of slots your server is allowed to run. Your config files have now been customized automatically for you! Go back to the previous directory where you see the mod, configs folder, and server.cfg. Edit the server.cfg to set your defaults (rcon password and stuff). This is the only config file you’ll need to edit manually. Save your changes and close your text editor. For a Windows server, the admins.ini file is in the main folder. For a Linux server, the admins.ini file is located in the MOHAA folder. You need to edit this file to create admin accounts with different permissions and custom logins. Read the “Reborn ReadMe.pdf” for help. Gives the test user full rights to the server using a login of test and a password of test. Stop your server using your provider’s control panel. Save the file and upload this to your server. Stop your server using your provider’s control panel. Upload the files in the server_mod\windows\ or server_mod\linux\ folder depending on your server’s operating system to the server’s MOHAA\MAIN directory. Start the server. Your server is now running the Ubermod. Move the files in the local_mod\main directory to your local PC’s MOHAA\MAIN directory. When you join your server, press F11 to setup the menu’s key bindings. You’re done! The Ubermod is installed on your server! Everything is configured for you to run anything! Check out this video guide which walks you through the entire process of configuring and using the ubermod! The MOHAAConfigGenerator application works on all Windows versions. Sorry, but there is noLinux version. If you have an autoexec.cfg file in your local computer's MOHAA/MAIN directory, you'll need to delete it or the client admin menu mod will not work! If you discover any bugs, have questions, or need help configuring something, post in the Ubermod thread at x-null! And others I may have missed. Your work has helped shaped this mod! Last edited by own3mall; June 22nd, 2014 at 01:46 PM. Really nice collection of mods, the only thing I'm missing is a spawn protect and anti-camp mod then it would be complete server package I think. I think you have the old Base Assault version because the new one is writed to the Reborn patch. I will send the new version to you. I am using version 1.0 which does use the reborn patch. Base Assault and 3rd Person Single Player Maps crashes though because of some reborn bugs which I hope will be fixed soon. I guess, though, I hate both mods. Send me links to these mods, and I can include them in the package. I've noticed a few bugs and will attempt to sort them out shortly. Fixed a clientside menu bug where the map change menu would not work properly. In terms of the ubermod, the config generator has a bug dealing with server passwords, which I was sure I had resolved before releasing, but I guess not. I'll be looking into it as well as adding some of the mods mentioned by members above for a future release 1.1 update.